Dorothy and Julie Firman are a mother/daughter pair who have been offering mother/daughter workshops throughout this country for more than 15 years. Both are psychotherapists. Both are mothers and daughters. Their work has been an inspiration and source of healing for thousands of women. 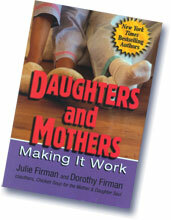 Their book, Daughters and Mothers: Making it Work is a continued source of healing for women. It combines theory, stories from women and from the authors and exercises to create a true opportunity for work towards wholeness. The book has been highlighted on radio and TV, including The Oprah Winfrey Show.